The Italy City Council awarded Graycon Construction of Mesquite the contract for the water storage tank construction, a part of the city’s water bond project, at its monthly meeting held Monday evening. Scott Hoelzle, with KSA Contractors, said nine firms bid for the project. Bids were opened Oct. 3 and the lowest bid — for $1,216,750 — was from Graycon. Hoelzel said he hoped to have paperwork completed within a month and then project could begin soon thereafter. He said the contractor will have a year to complete their portion of the project. Greg Richards made the motion to approve the recommendation with a second from Dennis Perkins Jr. The motion carried unanimously. In other business, two residents addressed the council regarding two separate items. Elmerine Bell addressed the council regarding a resolution authorizing the grant writer to apply for a Texas Community Development Block Grant (CDBG) to the Texas Department of Agriculture. Bell told the council that the primary objective of the CDBG is to develop viable communities by providing decent housing and suitable living environments, and expanding economic opportunities principally for persons of low-to-moderate income. Bell concluded with two questions – the first asking who the grant writer is and the second asking if the project will interfere with the homeowner rehabilitation assistant grant the city approved in March. The council approved $12,000 as the city’s portion of a grant up to $500,000 for repair to and/or construction of up to six homes of low income residents. Teri Murdock, city secretary/administrator, said Tim Glendenning is the grant writer for this grant application which seeks up to $275,000 to replace the water lines down Harris, Hardeman and Williams streets. The city’s portion of this grant would be $30,170, which, she indicated, did not have to be paid all at once should the city be awarded the grant. Mayor Frank Jackson said this grant application is not being handled any differently from all other grant applications. He said there is no hidden agenda. Jackson said the city staff did go door-to-door but said many residents throw written requests from the city in the trash. He said the city would have qualified for many grants had the citizens completed the information requested through the mail. Dean Carrell, public works director, said they are not the first city that has gone door-to-door to get participation for a grant project. The council unanimously approved the grant application resolution (#12-1015-01) with a motion from Rodney Guthrie and a second from Richards. The second person addressing the council was Frank Boyer. Boyer, who was in the sign business in the southern part of Dallas County, said the city’s adopted sign ordinance is not for this community. He suggested the council set up a committee to redesign this ordinance. He pointed out things he liked about the ordinance and things with which he disagreed. Boyer said he was opposed to requiring a business to purchase a sign permit and present drawings for approval. He didn’t like the fact that cars cannot have signs on the side that advertise the name and phone number of the business. He said they needed to leave local businesses alone. Jackson said they have worked closely with new businesses and have had no complaints for business owners about the sign ordinance. He said the city is certainly not going to run a business out of town. The council took no action regarding Boyer’s request. Mark Stiles, president of the Italy Economic Development Corporation addressed the council updating them about the pavilion planned across the street from city hall. He said the IEDC, which is spearheading this project, hopes to have the pavilion completed by Christmas. Stiles said questions have arisen as to why multiple bids were not requested. He said the IEDC does not fall under the same guidelines as the city and, therefore, is not required to get multiple bids. He pointed out that the IEDC is using as many local workers as possible. He said the IEDC has been talking about this project for months and suddenly people “come out of the woodwork” wanting to bid on the project. He praised Charles Hyles, a member of the IEDC for his hard work in researching and planning the pavilion. He said Hyles abstained from the vote when they named Ronnie Hyles the project manager. Stiles said he is hearing complaints as to why they didn’t build a fire station. He said the law will not allow the IEDC to build a fire station. He said the IEDC certification had lapsed when he took over as president. The IEDC could have built a fire station because they would have been “grandfathered” had the certification not lapsed. The council also approved an ordinance (#12-1015-01) updating the city’s personnel policies. There was some concern from Italy Police Chief Diron Hill regarding officers taking off on holidays. In the updated policy, he said the officer is paid eight hours if they take off on a holiday. Most of his full time officers work 12 hours and are required to take four additional hours of either sick, comp or vacation in order to take a full holiday off. Although he had that concern, he urged the council to approve the proposed policy changes and suggested they revisit the 12-hour shift issue at a later date. Guthrie made the motion to approve the ordinance with a second from Perkins. The motion passed unanimously. 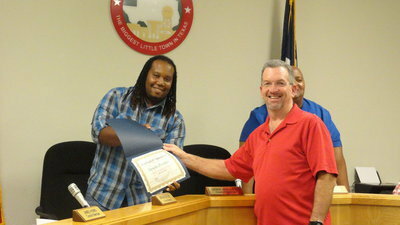 Although not on the agenda, eight young people – Tony Wooldridge, Marcus Surles, Cody Boyd, Tyvion Copeland, Brandon Jacinto, John Buchanan, Pedro Cortez and Andrew McCasland – presented the mayor with a plaque of appreciation. 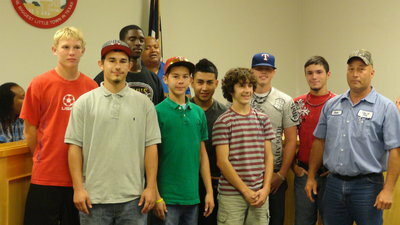 The city put money into the public works department to allow these eight high school students to work during the summer. During department reports, Hill said police officers were called to service 220 times in the month of September – a slight increase to the 179 calls to service in September of 2011. He pointed out that the top five reasons for calls to service included animal complaints, assisting other agencies, theft, suspicious person/vehicle and city ordinance violations. Hill said officers made eight arrests and worked a total of 1,423 hours in September. The animal control officer picked up three animals, issued one citation and was called to service 17 times. The code enforcement officer was called to service 12 times during the month. The Italy Municipal Court received 275 citations issued by the police department, cleared six warrants, wrote 20 collection letters and issued 33 warrants last month. Murdock said a ribbon cutting was held at the Boze Community Center Saturday evening followed by music by the Italy Opry. She said Taco Bell and Family Dollar are still moving forward with their plans to locate in Italy. In other business, the council passed a resolution (#12-1015-02) naming the Waxahachie Daily Light as the official newspaper for the city. They also reappointed Bell to the IEDC, approved bills, earned compensatory time and minutes from previous meetings. As the council adjourned, Paul Tate and Pat McGennis, asked to be recognized by the council. Tate is president of the Lone Star Cyclists, hosts for the annual Tour d’ Italia. McGennis is Tour d ’Italia director. Both had been at the school board meeting, going on at the same time, and had presented the school with $2,500 toward scholarships. 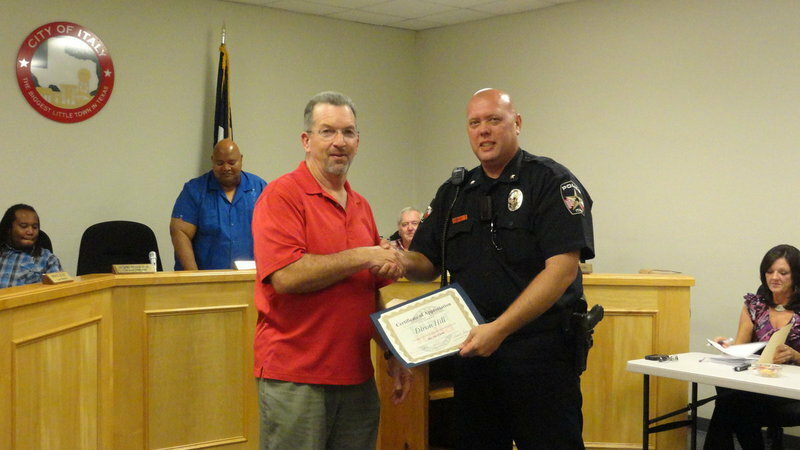 They asked to recognize Perkins and Chief Hill for their work with the annual bicycle tour held each June in Italy. Tate presented both with certificates of appreciation. He said there were more than 1,100 riders at the annual event held in June. He also praised the efforts of the police department by closing College Street to vehicular traffic during the start of the race. Council member James Hobbs was not present at the meeting.